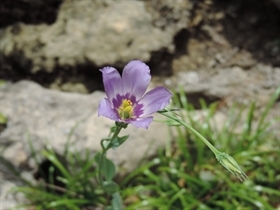 Habit: Eustoma exaltatum a herbaceous annual up to 1 meters in height. The sessile leaves are arranged oppositely, to 10 cm in length, ovate, with an entire leaf margin. The leaves are light green with a pale gray waxy cuticle and slightly succulent. The complete, perfect, actinomorphic flowers are arranged in few flowered panicles. The calyx has 5 unfused, green sepals. The corolla has 5, fused lavender or white petals that are yellow at their base. There are 5 stamens fused to the base of the corolla. The ovary is superior with a single locule and numerous seeds. The fruit is a capsule at maturity. Habitat: Eustoma exaltatum grows in and around fresh water wetlands as well as human disturbed areas. Distribution in Bahamas/Globally: Eustoma exaltatum occurs throughout the Bahamian Archipelago, the southern half of the United States, south through South America and the entire Caribbean region. Medicinal/Cultural/Economic usage: Eustoma exaltatum has been used to treat eye problems in the Bahamas.